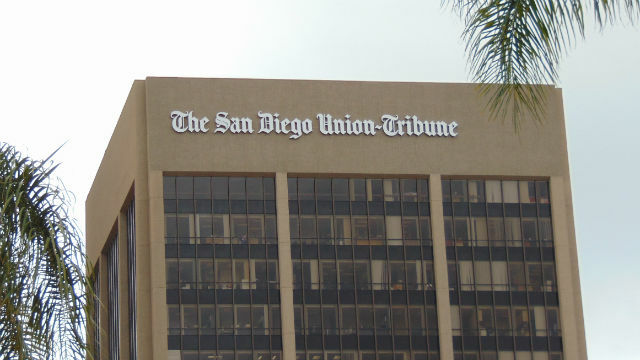 A computer virus prevented The San Diego Union-Tribune and other current and former Tribune Publishing Co. newspapers from delivering Saturday print editions. The virus caused production problems at a printing plant in Los Angeles where the Union-Tribune, Los Angeles Times and other newspapers are printed, U-T editor and publisher Jeff Light wrote. According to Light, the virus impacted computer systems of Tribune Publishing that are still shared by the U-T and the Los Angeles Times, which were purchased by Los Angeles billionaire Dr. Patrick Soon-Shiong in June but haven’t yet transitioned from the old systems. The attack apparently began late Thursday and had spread to critical systems by Friday, Light wrote. Teams from both companies were making progress against the virus, but weren’t able to fix it before the newspapers went to print. U-T print subscribers should receive their Saturday papers with the Sunday edition, he wrote. The problem wasn’t just limited to Southern California, though. Tribune Publishing newspapers across the country were also affected, including The Chicago Tribune, Baltimore Sun, Annapolis Capital-Gazette, Hartford Courant, New York Daily News, Orlando Sentinel and Fort Lauderdale Sun- Sentinel. “Every market across the company was impacted,” said Marisa Kollias, spokesperson for Tribune Publishing. The Southern California editions of the Wall Street Journal and The New York Times were affected as well, according to Light. Both newspapers are printed at the same facility as the LA Times and the U-T.
A later story on the U-T’s website said the source of the virus hadn’t been determined, and it also affected customer service phone lines that readers use to report problems with delivery. A spokesman for the FBI’s San Diego field office said he could offer no information on the situation. A spokeswoman at the FBI’s Los Angeles field office would neither confirm nor deny that the agency is investigating the apparent attack.